Plant: Tall, upright habit, branching types. Stem: strong pigmentation, with developed wings, straight. extended (I = 1.88); Semi-Knocked limb. 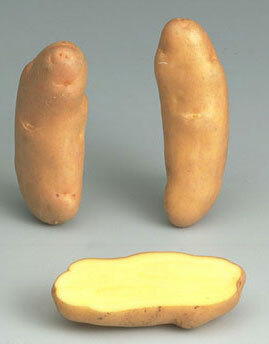 Grading: Proportion of large tubers: medium. vigorous variety giving numerous tubers, of medium height, beautiful presentation of their regularity and color. The well-yellow flesh is however sometimes veined pink.